In the expanded ProChannel, click the module’s enable/disable button . Note: The more ProChannel modules you enable, the more CPU resources are required from your computer. Click the Add Module button in the Inspector and choose a module on the pop-up menu. Right-click a module header or blank space in ProChannel and select Insert Module on the pop-up menu. Figure 413. Click the Add Module button to insert a new module. Note: You can insert multiple instances of external ProChannel modules. However, you can not insert multiple instances of the internal ProChannel modules, including QuadCurve Equalizer, Tube Saturation, PC76 U-Type compressor, and PC4K S-Type bus compressor. Right-click the module header and select Remove Module on the pop-up menu. Right-click a module header or blank space in ProChannel and select Replace Module on the pop-up menu. The signal flows from top to bottom. Click a module’s gripper and drag the module up/down to the desired position. Figure 414. Drag a module’s gripper up/down to reorder the signal chain. Click a module to make it the active module. The active module is shaded slightly. You can use ACT to control parameters in the active module, and all context menu commands operate on the active module when right-clicking an empty space in ProChannel. Insert and arrange the ProChannel modules in the desired order. To specify the default configuration for tracks. Right-click any empty space in a track’s ProChannel and select Set Modules as Default for Tracks on the pop-up menu. To specify the default configuration for buses. Right-click any empty space in a bus’ ProChannel and select Set Modules as Default for Buses on the pop-up menu. By default, the ProChannel signal is routed prior to the channel’s FX Rack (pre). To route ProChannel after the FX Rack (post), right-click any empty space in ProChannel and select Post-FX Rack on the pop-up menu. The QuadCurve Equalizer graph is divided into four sections, which correspond to the Low, Low-Mid, Mid-High and High bands. 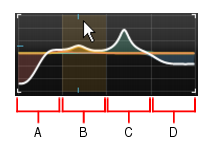 When you move the mouse pointer over the graph, the current band is highlighted. Note: The High Pass filter and Low Pass filter can not be edited from the graph. To adjust a band’s gain, drag up/down. To adjust a band’s frequency, drag left/right. To adjust a band’s Q, hold down the ALT key and drag up/down. To adjust parameters with finer precision, hold down the SHIFT key while dragging. To enable/disable a band, click the band’s region in the graph. Figure 415. QuadCurve Equalizer graph. SONAR lets you easily copy EQ settings from one track/bus (source) to another track/bus (target) when using the integrated per-channel EQ in the Console View or Track Inspector. To do so, hold down the CTRL, click the source EQ plot and drag to the target EQ plot, then release the mouse button and CTRL key. The EQ settings are copied from the source track/bus to the target track/bus. The target EQ will automatically be enabled if it was not already enabled. This command is undoable, so you can quickly and easily revert to a track/bus’ previous EQ settings. Add the PC4K S-Type Bus Compressor module. Under Side Chain, click the On/Off toggle. Figure 416. Add the PC4K S-Type Bus Compressor module in order to use sidechaining. To load an existing preset, click the Load Preset button and navigate to the desired preset file. To save a new preset or overwrite the current preset, click the Save Preset button , type a name, then click Save. Note: To see the Load Preset and Save Preset buttons in the Inspector and collapsed Console view strips, hover the mouse over the Preset control. Figure 417. Use presets to save and recall favorite settings. By default, the Track Inspector dynamically updates to show the current track. However, you can choose to always show a specific instance of ProChannel regardless of which track is current. Click the ProCh button at the top of the Inspector. ProChannel is displayed in the Inspector pane. Click the Track Name control at the bottom of the Inspector and select Lock the current track or bus from the drop-down menu. To unlock the track or bus, select Lock the current track or bus from the menu again. ProChannel is only included with SONAR Platinum and Professional, not with SONAR Artist or SONAR Steam Edition. If a project was created in Platinum or Professional and loaded into SONAR Artist or SONAR Steam Edition, the project might sound different because ProChannel is not available. However, if you resave the project in SONAR Artist or SONAR Steam Edition, all ProChannel settings will be persisted and available if you later load the project into Platinum or Professional again. If you load a pre-SONAR Professional/Platinum project that uses the per-channel Sonitus:fx EQ, the ProChannel QuadCurve Equalizer module will be disabled. If you want to keep and edit the Sonitus:fx EQ, double-click the small Equalizer graph in the collapsed ProChannel. Press CTRL and click the Equalizer enable/disable button . Enable the Equalizer module. SONAR prompts if you want to switch from the Sonitus:fx EQ to the ProChannel QuadCurve Equalizer. SONAR X1c and earlier only support a single compressor module per channel. 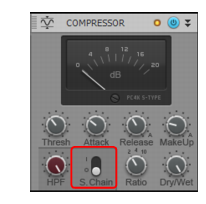 If you are using multiple compressor modules on a channel in a SONAR X3 project, SONAR X1c (or earlier) will only load one of the compressors. SONAR X1c and earlier always shows the Compressor, Equalizer and Tube Saturation modules on all channels. If you load a SONAR X3 project that doesn’t use all the default modules, SONAR X1c will automatically recreate the missing modules. If you load a SONAR X3 project that has ProChannel Global Bypass enabled, you will not be able to unbypass that ProChannel instance in SONAR X1c.